Speaking of bugs I must share this with you. Upon getting our first cockatoo, a goffin, whom in fact is an import. 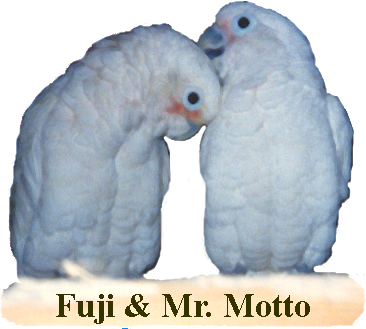 I felt compelled to give her, "Baby Fuji Motto", (our goffin cockatoo that we called, "Fuji", for short) everything she may have missed from her home land. Carrot tops I grew myself, even letting "Fuji" dig them out herself. Along with sprouted seed and wild seed grass for Fuji (all in the quest for the best nutrition possible), I thought why not a bug, but how would I know it was clean and healthy? Well, I was told of a place where they raised crickets (thinking this would be ideal) out to get the cricket I went. The first one I offered her, was crushed a little. Fuji proceeded to pick it up and flip it over her back. As she often did with her toys, as an amusing gesture with a silly look on her face. Like did you see that, am I not funny? And of course she was. I then thought to myself Fuji doesn't want it because in the wild if it is crushed and dead, she must think it's not fresh. I certainly knew how to fix that. I pulled out a live cricket and put it in a pail, so not to let the cricket get away. Fuji, waiting to see what I would bring her next, all the while she is leaned way out on her perch. By the anticipation on her face, I could tell she was waiting for more games. To myself I thought this will be good Fuji will think of her days in the wild and enjoy this special treat, that I went to so much trouble to select for her. Fuji leans over even further, I tilt the pail with my anticipation of her joy. Fuji sees it all right! She lets out a blood curdling scream of fright that would have shattered the best crystal, had I any. Her crest raised high, Fuji had to have another go of it. This time the bug jumped, I thought her scream had broken the sound barrier. I shan't try that again! Never the less Fuji has recovered and will actually make us take her to a pail. Just to have a look, and sometimes Fuji screams, pretending that there is something scary. Kind of like we humans that watch scary movies on the edge of or seats, vowing not to do that again. Until the next scary movie is released. Could it be our goffin cockatoo "Fuji" didn't eat bugs in the wild like many books I have researched through? She certainly acts to dignified to do so. However I did continue on with my quest for the best nutrition, as I still strive to do. As for Fuji you ask? Undoubtedly we still have her, and yes there have been many other episodes. Like pasta and cooked noodles she put on her head. Insisting to wear them as a little birdie wiglet. But that's another story and I'll save that one for another time.